Spiral Separators are used in the seed industry for separating good soybeans from splits or weed seed. Spiral Separators are often used in industrial applications such as separating metal abrasives, metal shot, ceramic beads, glass beads and other types of material. Spiral separators operate on gravity only – product is loaded in the hopper, or direct feed tube on a single spiral. The material flows over an adjustable cone and divides the material evenly onto the inner flights. 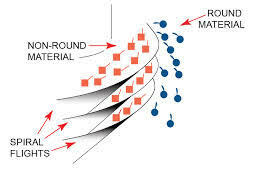 With increasing speed, the round material will separate and roll off the inner flights onto a larger outer flight and then exits a side discharge chute at the bottom. The non-round material on the inner flights will exit a center discharge chute at the bottom.